Believe it or not, this recipe is a salute to a trick I learned from my mom. When the price for certain fruits were too high, she would use good old jello in place of that fruit. As an example, she used to make raspberry and lemon cake. Most of the time raspberries, fresh or frozen, were simply priced out of the budget but……..that did not stop her. To achieve that flavor only, she would substitute raspberry-flavored jello. 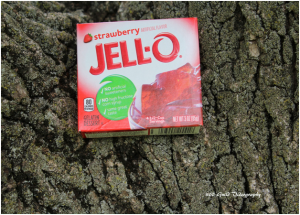 In this recipe, the strawberry-flavored jello adds that sweetness of strawberry without the fruit. Yes, you can use fresh or frozen strawberries in place of the jello if you would like but if you do this you will need to add more cake mix and cook it a bit longer. You will also want to eliminate the water since the strawberries will provide their own juice, regardless if they are fresh or frozen. Begin to prepare the coals by building a fire. Place cubed rhubarb evenly in the Dutch oven. Sprinkle the top of the cubed rhubarb with granulated sugar. Spread the strawberry-flavored jello on top of the granulated sugar. Dust the cake mix on top of the jello layer. Pour water on top of the cake mix layer. Place a grilling rack above the hot coals. Put butter or margarine in a small Dutch oven and melt. Once melted, pour the melted butter or margarine on top of the water/cake mix layer. Do not stir. Add lid to the 12 inch Dutch oven and move to a heat resistant surface. Arrange 12 prepared coals in a circle on the heat resistant surface. Place Dutch oven on the circle of prepared coals. Top the lid with 16 prepared coals. Once the time has passed, knock off the coals from the lid. Remove the Dutch oven from the circle of prepared coals.